Make delicious chicken thighs on the grill at your next Barbecue. Let me tell you three different grilling techniques that we use and love! It's great when the men (or women) in your life are easy to please, and there's nothing as easy as cooking up some barbecued chicken thighs on the grill. There are many parts to a chicken, but the dark thigh meat is what my husband used to love, and son loves best. 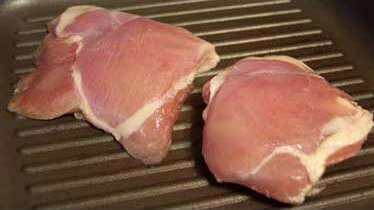 Thighs have just a little more fat in them than white meat, it's tastier and not as dry...unless you over-grill. Marinades, cooking temperature and time on the grill can be big factors in how moist your chicken thighs are. Here is how we cook what we think are the perfect grilled chicken thighs. The picture in the introduction and to the left shows chicken cooked with the skin still intact. This does help keep moisture in the meat, but for years, due to a need to avoid excess fat in my husbands diet, and the fact that it's generally healthier, we have removed the skin from chicken before it goes on the grill or any time it is going to be cooked in a way that does not "cook out" the fat. We maintain moisture with marinades and grilling temperature. First, take your thighs and remove all of the skin. Remove as much of the yellow fat that may be attached to the thighs as you can. This will save you a lot of flare-ups when grilling. Chicken fat starts a flame easier than any other meat I cook on the grill, and singes or burns the thighs if I'm not careful. Wash the thighs and pat dry with a paper towel. Tip: If you want to leave the skin on to maintain moisture, make sure to carefully apply your seasoning and marinate UNDER the skin before grilling, then remove the skin before eating. BE SURE to wash all surfaces that have come in contact with the raw meat well. I wash and wipe down with disinfectant wipes. What Is Your Favorite Meat to Cook on the Grill? Thanks for taking our poll and happy bbqing to you! The marinade we use is something many already have in the refrigerator or cabinet...low-fat or fat-free Italian Dressing. It adds a great flavor, and isn't expensive to buy. It's delicious on grilled thighs. Take a large zip-lock food storage bag, and anywhere from the night before to a couple of hours before you're ready to grill, take your skinned thighs and put them in the bag, then pour some of the salad dressing/marinade in and seal, releasing as much air as possible before sealing. For a family of 4, assuming each eats a couple of thighs, about 1/3 - 1/2 the bottle should do. Now lay the bag flat and move the meat about so it is flat and surrounded by the marinade. You can turn the bag over 1/2 way through the marinating process, but it's not absolutely necessary as long as all sides of the meat are in the dressing. You can store this in the refrigerator until you are ready to grill. When it's time to grill, if you have chosen non-fat dressing, cook slower at a lower temperature than if you chose one with oils in the dressing. Tip: Have a little dressing in a cup with a basting brush, and if your meat looks like it is drying out during grilling, baste it. Which Barbecue Basting Brush Should I Choose? We have been using an old basting brush for years, but the handle is not long and the bristles are wearing out. Each of these has advantages. I know my husband likes stainless steel, but I like the idea that the heads can be removed in the second model pictured to the right. A good basting brush with a long handle is essential for grilling. If you would rather use barbecue sauce, there will be nothing between the hot grill grate and your skinless meat when you put it on the grill, so before lighting the grill, we spray the grate with olive oil cooking spray...any cooking spray will do, or you can brush the grill OR chicken thighs with cooking oil. Please don't forget to spray the grill before lighting, it's an easy and dangerous mistake to make. Next, we brown the outside of the chicken quickly to seal in the juices, then turn down the heat so that the chicken cooks very slowly. This will keep it from drying out. When the meat has about 10 minutes time left before it will be done, we begin to baste it with our choice of Barbecue Sauce, you can use any flavor you prefer...first on one side and grill a bit (don't burn), then baste the other, turn and grill...and that's all there is to it! If you don't want to use a marinade or barbecue sauce, using Mesquite Chips in the grill while grilling is a great way to add subtle but delicious flavor to the meat. There are other wood chip flavors, but Mesquite is a family favorite. We use a gas grill, so we use a small metal pan, large enough to hold a cup or two of chips, then dampen the chips with water. The pan is set right down onto the rocks in the grill in a corner where it will be heated and smoke to add flavor to the meat, but will not block the heat from your chicken. The secret here is to cook the meat slowly, so that you don't dry it out, and so those flavors have time to permeate the meat. It smells great while your barbecuing your chicken with Mesquite chips. To finish this page, below are just a few things that will make your grilling experience fun. Obviously you can't barbecue unless you have a barbecue grill. You may be one who insists that using Charcoal is the only way to grill. We did that for years, until my hubby decided he wanted to get a propane Weber grill. We have been using our Weber for years now and it's still in great shape, has lasted longer than any of the grills we've had before it. And obviously, you need utensils with long handles. Summer is starting soon in our part of the country, so grilling season is here. Some of you are fortunate enough to live in places where you can grill all year round. I wish you a very happy season of barbecue cooking! Thank you, @frankbeswick - with the warmer weather I have been out on the deck more, looking at his grill, missing him. Maybe later in the season I'll be ready to light it up. Thank again. My condolences on the loss of your husband. Thank you, @Margielynn We did a little barbecuing early in the summer, but my precious hubby passed away in early August, so his grill sits quiet now, until I feel ready to use it again. Still, these are my favorite ways to grill chicken. Yummy, you Made me very hungry! Loved your page! 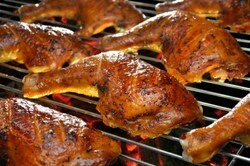 @CruiseReady We just had chicken thighs last night, and yes, nothing like barbecued food to make me hungry. You are making me hungry! The marinade using Italian dressing seems most appealing, an your tips are great, too. @Marie Chicken is one meat that we do eat quite often, I tried to go without meat for a time, but it did not agree with me at all. If you believe in the blood type diet theory, I am type 0 so hunter gatherer type, and meat is very important to my diet. Paradoxically, I'm an animal lover, too. @sheilamarie It is amazing how just reading can stimulate memories and tastes from our past! Thanks for visiting today. I don't eat meat very often but I really love BBQ chicken which is delicious. As I read, I can taste the barbecued chicken thighs my Dad used to make. He used the same marinades that you do. Quinoa (pronounced "keen-wah") is seed that has become a popular side dish or part of recipes. The protein to carbohydrate ratio is higher in Quinoa than Rice.